After Ferrari had built and raced a series of six- and eight-cylinder cars under the Dino banner (so named to commemorate Enzo's fallen son), it was inevitable that a road-going car would be built under this name, and in 1968 the gorgeous mid-engined, two-seat Dino 206 GT appeared. 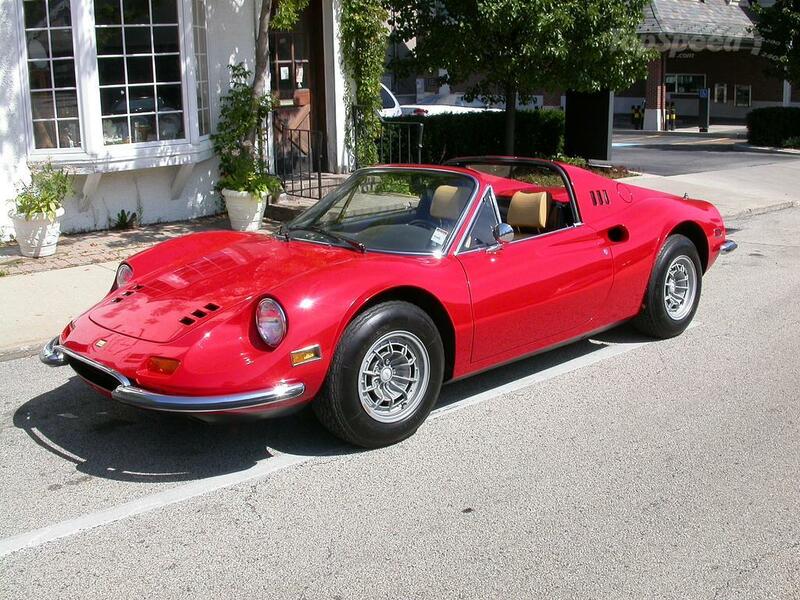 Like many Ferraris of the period, the Dino's beautiful body was designed by Pininfarina and produced by Scaglietti, and in this case was aluminum for the entire run of 150 built in late 1968 and 1969. The transverse mounted 2-liter, 160-hp V-6 had an aluminum block as well, built by Fiat. Production of the 2-liter 206 GT ended in 1969 to make way for the 2.4-liter 246 GT. The 246 GT's coachwork was almost identical to the earlier car, this time in steel, possibly as a result of Ferrari realizing that this car was going to be produced in numbers never before seen by the company. Cast iron replaced aluminum for the new car's engine block, and this motor now made 195 hp initially, and 180 hp for cars sent to the United States. Enthusiasts generally group the 246s into three broad categories. The first series of 357 built are known as the "L" cars, identifiable by their having the same wheels as the earlier 206 GT. The "M" series cars, of which 507 were built, had Cromodora wheels and a different windshield wiper arrangement. Finally, the "E" series cars appeared in late 1971 and were the most numerous, filling out the balance of the total 3,883 cars built. Included in this final series was the 246 GTS, which incorporated a neat Targa-style removable roof for those who desired an open-air option. "Chairs and Flares" are the most desirable optional equipment for these cars, and the phrase refers to Daytona-style seats and metal flares that widened the bodywork. While these two options typically appeared together, they could be ordered separately as well. The Ferrari Dino 246 GT's $14,500 MSRP was comparable to the Porsche 911 during the early 1970s, the car it most closely competed with. Since that time, the Dino has appreciated in a way that its German counterpart has yet to see. Furthermore, the Dino’s 2.4-liter V-6 creates a wonderfully entertaining high-RPM scream just a foot behind the driver’s ears, which simply heightens the ownership and driving experience even more. Very impressive for a car that was a "budget" offering when new and wasn’t even deemed worthy of the prancing pony badge.